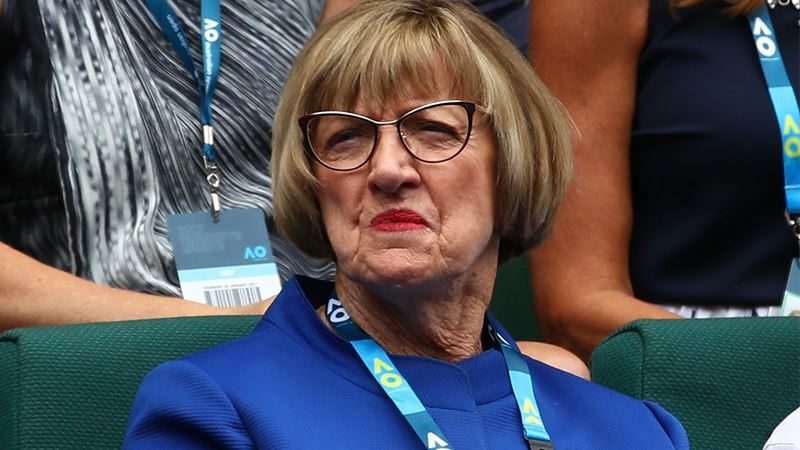 Margaret Court says tennis “is full of lesbians.” As if that’s a bad thing. Moreover, ol’ Maggie informs us that there were a couple of devil lesbians on the professional tennis circuit back in her day and, get this, they would take young players to parties. Imagine that. Young women partying. With lesbians. The horrors. Ol’ Maggie has been saying a whole lot of oddball things lately and, if we are to believe the preacher lady from the Land of Oz, civilization is caught in the grip of a global plot orchestrated by the gay, lesbian, bisexual and transgender collective. Those pesky gays are stealing the minds of our children, don’t you know? Hmmm. Kind of reminds me of what the Roman Catholic Church tried to do to me when I was a sprig. The nuns, when not whacking us on the knuckles with a yardstick, would regale us with far-out tales of fantasy gardens, poisonous fruit, hell fires, voodoo antics like turning the rib of a man into a woman and, best of all, talking snakes in a magical tree. Their stories were better than anything we watched on The Wonderful World of Disney. But apparently Margaret Court believes all the Bible-based, brainwashing blarney that my receptive mind was force-fed, and it’s quite clear that the great Australian tennis champion is convinced that gay and (especially) transgender people are the spawn of Satan. “That’s all the devil,” she says of transgender kids. “I believe marriage as a union between a man and a woman as stated in the Bible,” she harrumphs. Well, it’s about your Bible, Maggie: One person’s truth is another’s fiction. The prune-faced preacher lady has been battered fore and aft for her Bible-thumping bleatings, which included a disapproving and extremely tacky tsk-tsking of Aussie tennis pro Casey Dellacqua and her partner Amanda Judd following the birth of the lesbian couple’s second child, a joyous event that Court greeted with “sadness” because the newborn has two mamas and zero papas. I’d rather not join the Maggie-bashing chorus, though, because I think she’s unwittingly done the gay community a small favor. The hell, you say. How can that be so? Well, to be clear, I find her drawing a parallel between the LGBT collective and a mass murderer, Adolph Hitler, repugnant. It is not only offensive in the extreme, it shows she clearly has lost both the plot and the argument. She appears to be totally off her nut. But…I also think ol’ Maggie has provided us with a reminder, albeit appalling—at the top of Pride Month, no less—that we still have work to do. The fight for acceptance and equality continues. It has not been won. We must keep society’s feet to the fire. I suppose we really shouldn’t care what comes out of this nutter’s mouth, but Court is a legendary sportswoman. No one has matched her two dozen tennis Grand Slam singles titles. One of the playing venues at the Australian Open in Melbourne is named in her honor (for now). And she is a pastor (the argument could be made that she’s more of a cult leader given that she created her own church, the Victory Life Centre in Perth). Thus, her voice carries some degree of heft. If not, the pushback from gay, transgender and, indeed, straight people against her homo/transphobic tripe wouldn’t be so robust. I’ll just say this about that: Freedom of speech is a beautiful thing, but so is the freedom to shut the hell up. Ol’ Maggie might want to give that a try. Now, if you’ll excuse me, I’m stepping out to party with some lesbian tennis players. Next Next post: About bad behaviour in sports…straight guys talking about gay things…sports scribes eating their own…the unlovable Blue Jays…clay-court tennis…and cole slaw on a hamburger?